The community center here was known as Royal Oak, home of Arthur Campbell, son of David Campbell and a frontiersman in the late 1700’s. 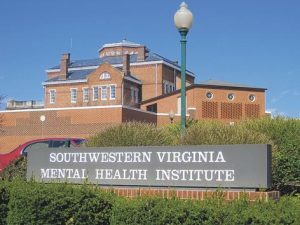 Marion is home to the Southwestern Virginia Mental Health Institute. Opened in 1887 it was originally named the Southwestern Virginia Lunatic Asylum, but was renamed Southwestern State Hospital in 1902. At its peak, the Institute housed more than 1,500 patients (1955-1970). Marion is also known as the home of Mountain Dew, but the original drink was created in Knoxville, Tennessee. Although Mountain Dew was first marketed under that name in Knoxville, the original soft drink’s formula changed drastically from Knoxville’s formula to that of today. The Cherokee word meaning “valley of many deer,” was adopted as the town’s name when the town became incorporated in 1913. 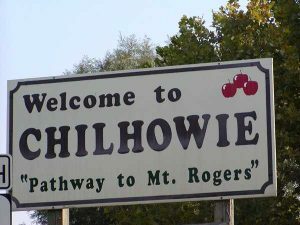 Chilhowie was often the starting point of hunting expeditions in the 1700s. Around 1748, Col. James Patton patented land here and reportedly hoped this site would one day become a town. The region became known as Town House for a house known by this name that stood nearby. By the Revolutionary War, a settlement of the same name began to develop around the house. In 1856, the Virginia and Tennessee Railroad arrived and the settlement was renamed Greever’s Switch for a local resident. The community’s name was changed to Chilhowie in the late 1880s at the suggestion of George Palmer. 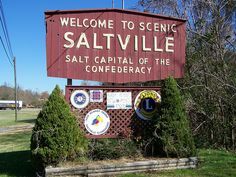 Saltville is named for the salt deposits that exist under the valley. The commercial salt industry began here in the 1780s. During the Civil War, Saltville was one of the Confederacy’s main saltworks. Because of its importance, the town was attacked by Northern forces intent on destroying the saltworks. On October 2, 1864 the First Battle of Saltville was fought here. In the battle Union forces attacked Saltville but were defeated by Confederate troops. Following the battle a number of wounded black troops were murdered in what was called the “Saltville Massacre.” Two months later Union forces led a successful second attack on the saltworks (known as the Second Battle of Saltville). The loss of the Saltville works was considered a major blow to the Confederacy’s dwindling resources. 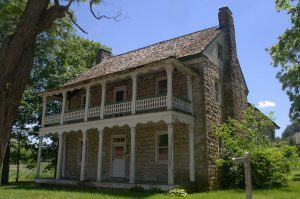 Old Stone Tavern, also known as Rock House, is a historic inn and tavern located near Atkins. It was built about 1815, and is a two-story, three bay, limestone structure with a central-hall plan. The tavern was built to accommodate travelers in the heavy migration through the Cumberland Gap to the west in the early 19th century. 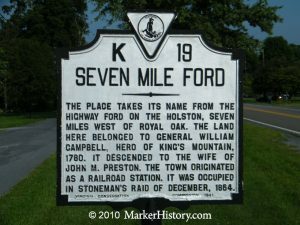 Seven Mile Ford is named for a ford of the river on William Campbell’s land seven miles from the ford near Authur Campbell’s fort at Royal Oak. The land was patented by Col. John Buchanan and transferred by him to his brother-in-law, Major Charles Campbell. In 1933 local residents assisted in the creation and donated 2,000 acres of land to Virginia for the establishment of a state park in Smyth County along Hungry Mother Creek. The unusual name comes from the legend of a nearby Indian-settler conflict that resulted in Molly Marley and her child being captured. They later escaped but Marley died. When a search party found the toddler who could only utter the words “Hungry Mother.” The National Park Service and the Civilian Conservation Corps, in conjunction with the Virginia Conservation Commission, developed the park as a New Deal project. 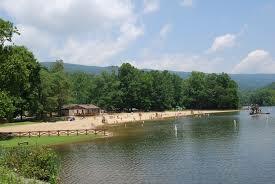 It opened on 15 June 1936 and was one of the first six state parks established in Virginia.